Hello and welcome to my blog! This blog is geared toward my hobby of watching anime. I will be blogging about anything that pertains to the realm of anime. Just a heads up, all my anime reviews are also posted on MyAnimeList where you can find me under the username Decoys, making this blog allows me to make my reviews even better by inserting images and music clips into my blogposts. 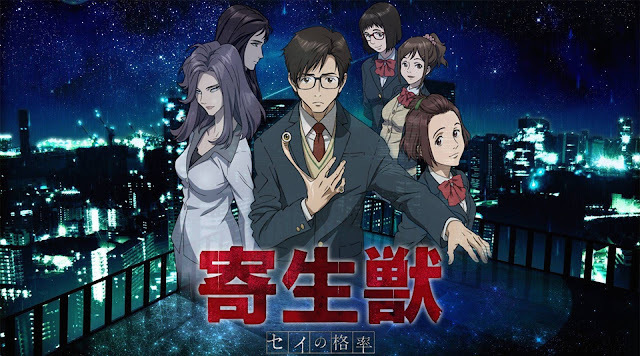 This is my first blogpost and it will be a review about the ever so popular anime, Parasyte from Fall 2014. When speaking with others online about Parasyte, the most common piece of criticism I hear that strays away those who don't want to watch is that it's "not my genre," it's "overrated" or "it makes my stomach turn while watching some scenes." Although I agree with most of these statements, it's because of these points that people should try watching - simply because it's a genre/ story that's not seen often in this generation. Putting that aside, the anime begins with a mini snake-like organism emerging from it's shell that fails to attempt to target a high schooler by the name of Izumi Shinichi, unable to attack Shinichi's brain to completely take over his body. However the organism develops it's own intellect in Shinichi's right arm and is named Migi (which is Japanese for right). The story is about magnitudes of these snake-like organisms taking over humans in Japan. If the brain has been successfully taken over, a parasyte is then born which then has the ability to morph body parts into blades and lengthen the human anatomy. To survive, these parastyes thrive on devouring the anterior portion of humans, killing with no second judgement. The main character Shinichi learns about this through his counter-part Migi and goes on a mission to kill any parasyte that poses a threat to society. After watching this and reflecting on it, it's clear that the anime was trying to illustrate the question of: "can someone who does not display human-like qualities, be humanized?" The answer to this question is, yes and it's heavily drawn out through the characters. We see that as the story progresses it's clear that parasytes are depicted as blood thirty creatures. However some of the parasytes like Tamiya Ryouko, who seemingly is out to kill, becomes more human as her storyline progresses. We also see this with Migi, Migi starts off as having no empathy for humans, Shinichi included, but gradually gains affection towards them as the episodes unfold. However when looking at Shinichi, the reverse occurs to him as he loses his some emotions and becomes less humanized. The art and animation is quite solid, and the sound stands out as one of my favourites. Although this anime is an adaptation from a manga in the 90s, I enjoyed that the art is drawn in a way that's up-to-date with the anime that's out now but yet still has that air from the art during the 90s as well. The animation is fluid but not that fluid in some regards as I hoped. For example, when we see the one-to-one combat between parastyes; the lightning speed combat with using lengthened limbs and blades are not that fluid. The OST is a stand out, one of the better ones out there against the others during the time this aired; which actually made me download the entire album. I presume everyone's favourite is probably "next to you." If you haven't heard it, I've linked that OST below for you to listen. Overall Kiseijuu: Sei no Kakuritsu was a great anime to watch. If you're looking for something that's out of your comfort zone or just looking for something new to watch, I would recommend this. I promise you that after the first episode, the cliffhangers will reel you in and possibly cause you to watch episode after episode until your done. If you made it this far reading my review.. thanks ! If you enjoyed my review please follow me on twitter and instagram as well as like my page on facebook so that you get updates on when I post my blogs.